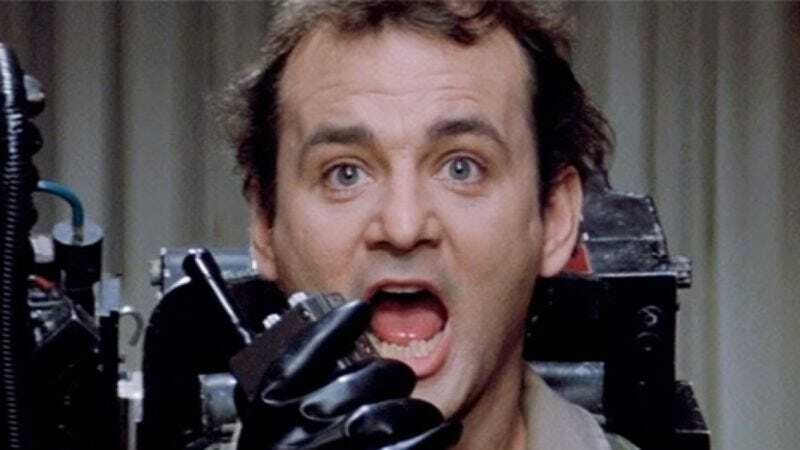 For years, Bill Murray was one of the most vocal opponents of any kind of Ghostbusters sequel, mostly because he’s primarily driven by goofball whimsy instead of the usual lust for money and power. Also, he assumed that a new Ghostbusters movie would require him to spend a lot of time wearing heavy proton packs with Dan Aykroyd, and he doesn’t really have time for that anymore. However, his attitude softened up a bit on the idea when he found out that Paul Feig would be directing a female-led reboot of the classic comedy film—though he still implied that he doesn’t really care who’s in a Ghostbusters movie as long as it’s not him. Now, in what will go down as another great Bill Murray “nobody will ever believe you” story, The Hollywood Reporter says that he’s actually going to be in Feig’s reboot. That’s as far as the information goes, though, so we don’t know who Murray will be playing in it, or if this will be an extended role or just a fun nod to the original. If he’s actually going to play Dr. Venkman, that’ll have big implications for the—pardon us—Ghostbusters Cinematic Universe, but it would still be a fun gag to see him pop up in a little cameo. Or, better yet, maybe he can be the new Slimer, just a disgusting blob that eats food, gets ectoplasm on people, and then has his face on a popular flavor of Hi-C.
Dan Aykroyd tweeted about filming a scene for the new Ghostbusters back in July, and he’s reportedly playing a cab driver. If that’s the case, Murray will also probably be playing a similarly unimportant character—no offense, cab drivers—but you never know. This could all be a trick to cover up a post-credits tag where the new Ghostbusters travel into an alternate dimension and meet the old Ghostbusters, and then they all travel to a third dimension and meet everyone from the Real Ghostbusters cartoon.